Pig Hog cables are precisely overbuilt to stand up to the most grueling tour conditions imaginable. They feature extra-thick 8mm wire, performance quality connectors, and tension-resistant stress relief. 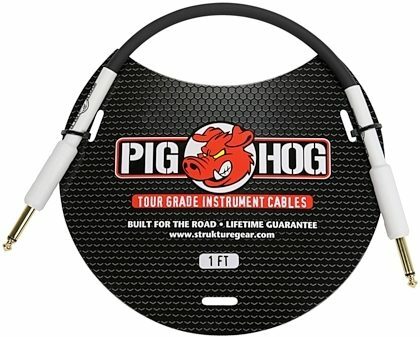 And with Pig Hog's "no question" lifetime guarantee, they've got your back for the life of the cable. Don't settle for those fat-free cables. Grab hold of a Pig Hog! zZounds is an authorized dealer of Pig Hog products. Overall: I ran out and bought one of these in a pinch and I was shocked at how substantial this cable feels. It's beefy, thicker than most of my other cables and has a surprising weight to it. I would prefer a right-angle option, but a high quality cable nonetheless.